MULTIPLE OFFERS RECEIVED-SHOWINGS SUSPENDED-NO SHOWINGS AFTER 4PM SATURDAY 4/7-ALL OFFERS BY 8PM SATURDAY 4/7 Fabulous light and bright 2 story home in Park View Commons! 4 Bedrooms on 2nd floor with 5 piece Master bathroom. 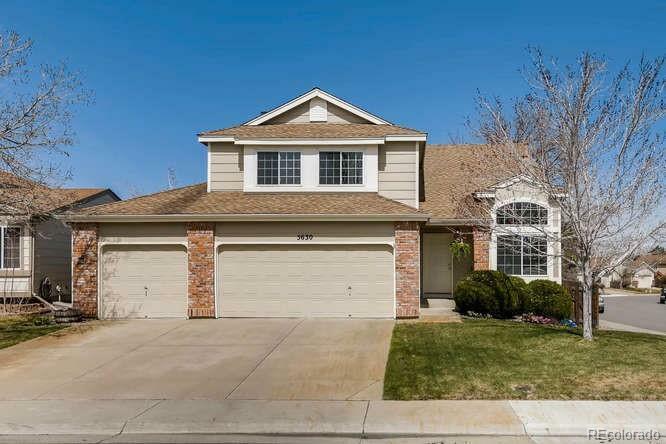 Vaulted ceilings with spacious main floor living & family room ~ Main floor laundry~3 car garage! Corner lot with fenced backyard + deck. All the big ticket items are newer so you can move right in and add your own special touches! Newer kitchen counter tops, A/C & Furnace 2014~Windows 2010 + lifetime warranty~hot water heater 2013~roof 2010~Fresh interior paint~lots of counter space +all kitchen appliances included! basement has one partially finished bedroom (has electricity, closet, window but needs flooring and more dry wall~the remainder of this bright, spacious basement is an open slate to design and use as you wish! Excellent community with walking paths, park, pool, greenbelts,~ cherry creek schools and minutes to the Southlands Mall, Buckley, DIA & E470!